Kanpur: a center of industry in Uttar Pradesh, a state that is home to two hundred million people. The region holds a poor reputation, one dominated by instances of corruption and historically made tense by religious violence. Tanneries are abundant in this city situated midway along Ganga’s length; four hundred in total. It lies 200 miles before Varanasi, the spiritual city of Hinduism where the sacred Ganges is medial. Here a dip in the water cleanses all sins – though it does not cleanse the chemical runoff, passing through with no consistent treatment facilities (sixty per cent of plants are shut or not fully operating, ninety per cent are failing to meet standards).The water in Kanpur gets hit hard with pollution, a toxic culmination made of raw sewage, mass amounts of leather production waste, and a little known culprit: flowers. Nearly 8 million tons of flowers are dumped in the sacred water every year. A nasty chemical effluent is created and dominates the water in Kanpur, and consequently the many miles that follow. The strong religious significance, the deep-rooted holiness of the Ganga’s water, can override its biophysical stability. Flowers used in religious practice have a sanctity, a reverence that necessitates discarding them respectfully in the water. The saying ‘beta yeh sab ka Jalprabah kar dena’ meaning ‘son, dispose these things in the river’ describes an ingrained practice. But what worships also pollutes: the flowers contain arsenic, lead and cadmium from farm runoff. They are pumped full with pesticides and insecticides. Once in the Ganges their thick residue dissolves to mix with chemicals and begin a rotting process that kills fish, suppresses the oxygen level, and produces compounds that wreck of toxicity. The cleanup of the waterway is backed by Modi, but the issue of floral waste is largely drowned out as blame goes towards industrial refuse. Changing habits, specifically deeply established religious habits, is nearly impossible. There are solutions, notably the social start-up Helpusgreen founded by Ankit Agarwal and Karan Rastogi. 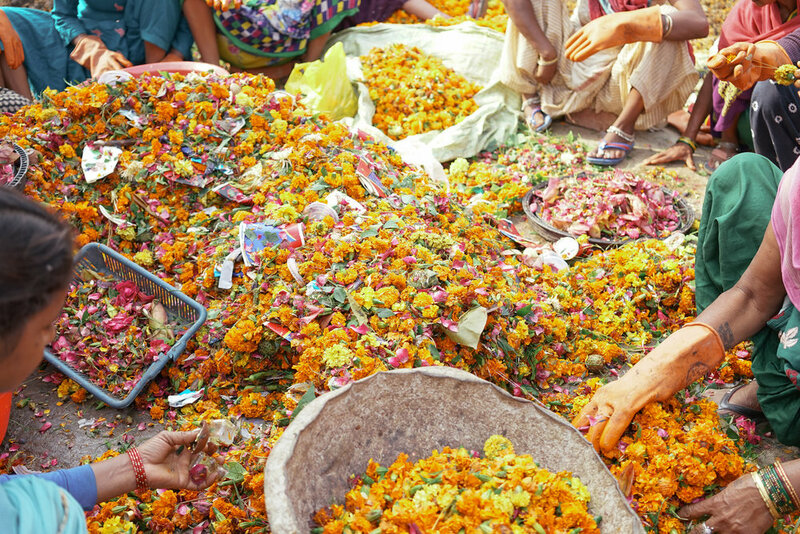 They are using a process coined ‘flowercycling’ to reduce the extortionate amount of flower waste that enters the Ganges per year. 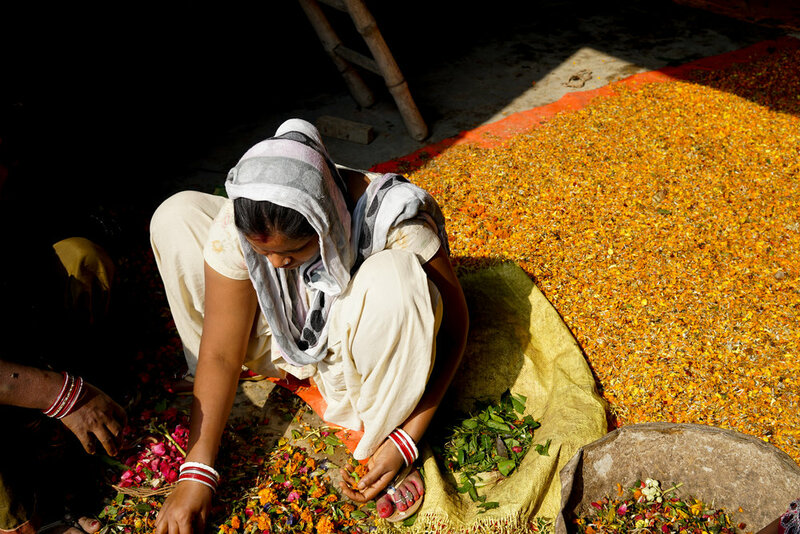 The process involves collection from local temples and mosques, drying the flowers to mix with natural resins and oils, and crafting them into organic fertilizer and incense sticks. HelpUsGreen cites that their work prevents 17,000 pounds of waste flowers and 200 pounds of toxic chemicals from reaching the waterway daily. The creation of HelpUsGreen’s products is done by rural women, 138 of them. Their employment supports their family and helps mitigate the cyclical nature of rural impoverishment. 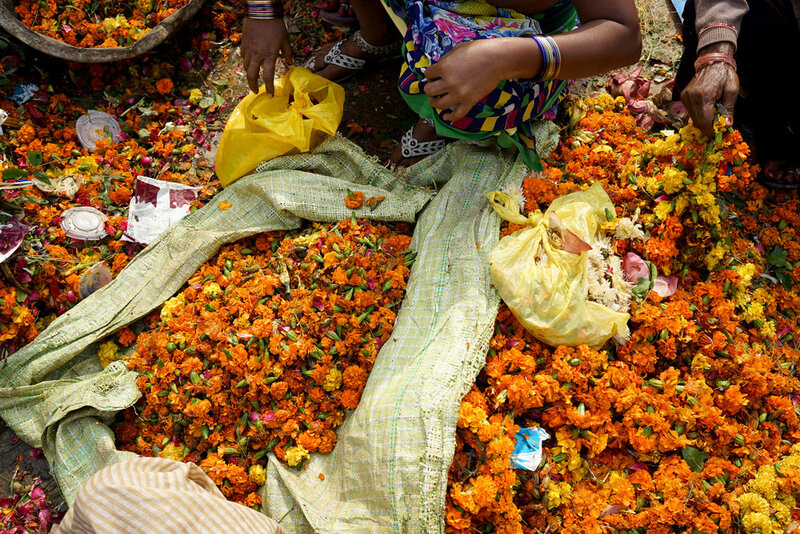 The images below are from days spent at their flowercycling factory on the outskirts of the city.